Beginning January 2019, the Monroe Municipal Utilities Authority will be inspecting all water meters throughout the township. We will also be conducting inspections to verify that sump pumps are not tied into the public sewer system. ALL MONROE MUNICIPAL UTILITIES AUTHORITY EMPLOYEES HAVE CLEARLY MARKED MUA VEHICLES AND PROPER IDENTIFICATION. 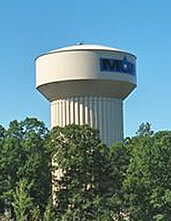 This Authority maintains the public sewer and water service in Monroe Township. The Authority Business office is located at 372 South Main Street. We are open 8 A.M. to 4 P.M. Monday through Friday. For billing call 856-629-1444; for service call 856-226-3628. If you are in need of EMERGENCY SERVICE AFTER BUSINESS HOURS OR ON WEEKENDS OR HOLIDAYS, PLEASE CALL 856-629-1444. We do have a 24 hour emergency service that will contact our employee on emergency duty. Our facilities, including our water supply, wells, tanks and lift stations have always been properly secured. In the event you see someone or something suspicious at any of our sites please contact the Authority Business Office at (856) 629-1444 or Monroe Township Police Department (856) 728-0800. There are no tax monies supporting the Authority. Its debt service and operational expenses must be paid by the revenue from customer service fees. For your information the Authority is governed by a five member Board. On an annual basis the Township Council appoints or reappoints a member to serve a five-year term. Our present Board members are: Joseph DiLolle, Jr, Chairman; Hank Calloway, Vice-Chairman; Robert Simone, Treasurer; Ralph Manfredi, Secretary; Anthony Neri; Assistant Treasurer, Robert Bender, Alternate Board Member. Authority meetings are held the third Wednesday of each month at the Authority Office, and the PUBLIC IS WELCOME. Our Operations and Administrative Staff take pride in maintaining a safe, healthy water system and sewerage collection system. If you should have a water or sewer problem, please contact us immediately. Every effort will be made to remedy your problem as quickly as possible.